Adventure Hostel Interlaken v Interlaken, Švýcarsko: Zarezervujte nyní! We provide 12 parking spots, free Wifi and our reception is open from 8-12am and 14-22pm. Take a seat in our garden and a beer, chill and enjoy this extraordinary view. The recently renovated house provides 5 cozy twin bedrooms, 1 single room, 2 family quads, 4 4-bed dorms, 3 6-bed dorms, 1 3-bed room and 2 apartments with a kitchen. Every room has its own bathroom. All dormitories have individual lockers for every guest. From each room you have a fantastic mountain view. To the south you'll see the famous 'Eiger, Möch and Jungfrau'. Our hostel is the only one from where you see all tree breathtaking mountains (more than 4000m high)! If you're adventurous enough, we recommend you a paragliding tandem flight from the nearby takeoff. Our staff will help you to find the right activity for you: paragliding, hang-gliding, skydiving, river-rafting, canyoning, bungee-jumping, jet boat and many more. Just ask our staff! 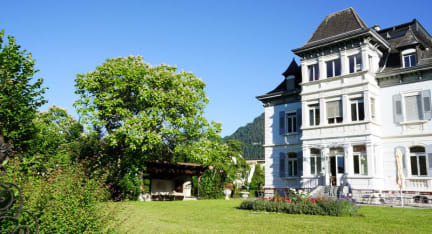 From the Hostel it is just a 5 minutes walk to the center of Interlaken where you can find restaurants, bars and the famous paragliding landing field 'Höhenmatte'. From the train station 'Interlaken East' you'll find your way to the 'top of Europe'. The breathtaking view from 3454m at the 'Jungfraujoch' will leave an unforgettable impression! In case of a late check in (after 10 pm), you will find an envelope with your name on at the reception's door. In this envelope you will find everything about your room and how to get your key. If you want to check out before 8 am, please leave the key in the room and make sure that is everything is paid the evening before. 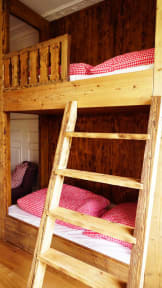 Taxes not included - tourist tax 2.80 CHF per person per night for guests 16 years and older. Reception opening hours from 8 am - 12 noon and from 3 pm - 10 pm. The times can vary in low season. For dorms: Towels are not included in the price and can be rented (CHF 4.00 per piece).